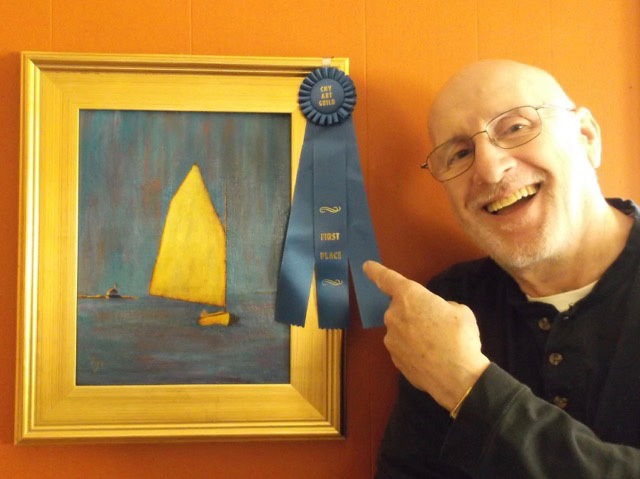 OSWEGO, NY – Congratulations to Lakeside Artisans’ founder Tim Ames on being awarded the first place blue ribbon for his Impressionistic interpretation, “Yellow Sail,” in the Central New York Art Guild’s Annual Art Show/Competition in Radisson. He recently visited Provincetown, Mass., the oldest art colony in the country and became enamored of the techniques of the Provincetown School of Impressionism, which this painting represents. This painting, along with the recent award winning painting “Cape Cod Victorian,” will be on display in Lakeside Artisans Gallery, 191 W. First St., Oswego.